How charming! This Antelope single wall hook seamlessly blends style with function; use it to add rustic charm to your home and to stay organized. 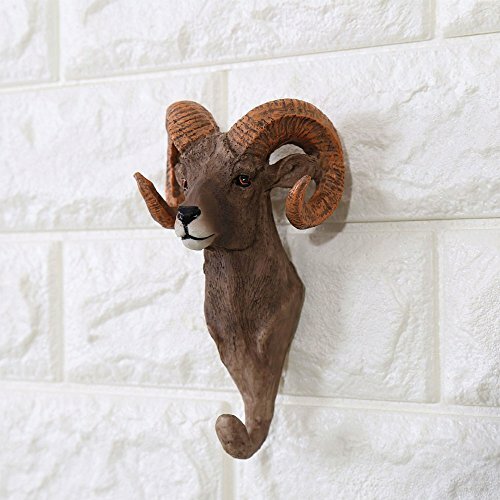 Animal Antelope Head hooks can show personality,Hand goods while adding a art and style on your house, make your home more neoclassical and show your personality. A Perfect Gift for the Wall Art Lover,the coat hooks can also be used as towel hook, key hook, jewelry hook, hat cook for bedroom, living room, kitchen and bathroom. Aways a nice Art product on the wall even if without handing goods,a new feeling make your house leave a deep impressive,you deserve. Made of Resin and Keyhole on back for hanging strongly,max hanging weight up to 5KG.Group would be better as wall decoration,Perfect for every room,Using them to creat a great beatiful house. Easy to install, you just need a hammer for quick installation. The mounting set is included. If you have any questions about this product by Rich Boxer, contact us by completing and submitting the form below. If you are looking for a specif part number, please include it with your message.